"Why are there so many churches and so many denominations in the world?" is a common question when someone wants a reason to discount Jesus and the Bible. Why, indeed! So we rejoice and know that it is only He Himself at work to help us actually begin to partner with another church, rather than stay isolated in our own walls. So far, we shared one Life Night Special Dinner hosted by our Peruvian missionary friends and are planning a summer Vacation Bible School (VBS) together with them – unity! A huge God-gift this month came in the form of a gal who feels a burden to help one very technical area of need: our online presence. We have had several visitors who "found us on the web," so join us giving a huge "Yay, God!" for sending us Denise who’s helped our internet abilities and presence immeasurably! We’re even on FB now! Also, available online is the latest article Donna wrote, published by CCCA’s “InSite” Magazine and another might be on the horizon shortly as well J We are very encouraged to see God bringing new life and new directions. Having recently heard that our long-beloved camp in the Adirondacks has now decided to leave the Cedarbrook Association, Donna is now working directly for the Association and looking forward to see Him moving there. Please let us know how we can unify with YOU as well in what we pray for you. THANK YOU for joining with us in these endeavors! 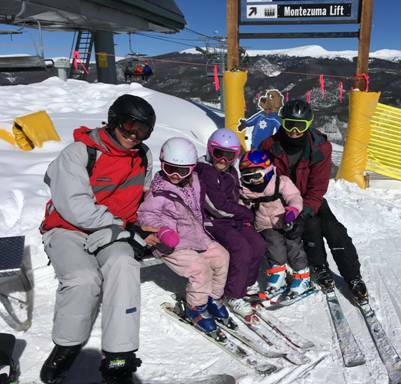 Min-mountain at Keystone with Matti (5), Zoe (8) and Gwendi (3).